Click here for a PDF of the most recently available Sunday Bulletin, including Announcements. Family Promise is entering its fund raising campaign called Road Builder 278 in which we are asking individuals to donate $278 to Family Promise. This amount will provide services to a family for 14 days. We are asking any person who has a heart for homeless children to give so that Family Promise can get started with helping families move out of homelessness. There is no financial donation that is too small or too large. We need your help to begin rebuilding Family Promise. The mailing address is: Family Promise of NewRock, Inc., PO Box 81551, Conyers, Ga. 30013 or donate online here. Family Promise facebook page. 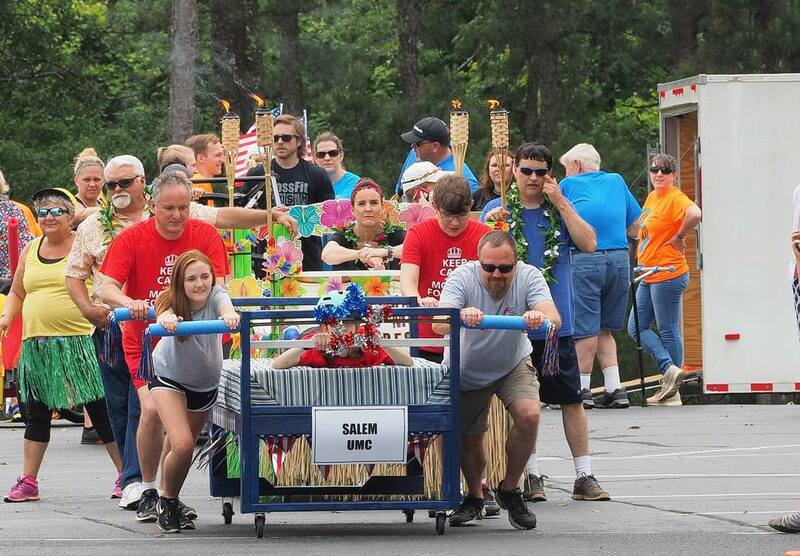 Read about the upcoming 2019 Bed Race! Please bring your canned food items for the Food Pantry and place in one of the several blue collection barrels scattered around the church campus. There are many needy families in our community. IDEA: Publix has buy one—get one FREE items each week. Please help us feed those who are needy, and hungry, in our community. Unfortunately Salem does not offer its own Food Pantry. We help by giving these collected foodstuffs to the community food pantry in Covington; please contact them at 770-784-0037 to see if they can help. Thank you, and God bless! Salem UMC is hosting Family Promise on September 24 - October 1, 2017. If you can be of help please contact Carol Standard at 770-313-4178. Your prayers and participation are greatly appreciated. FOOD: Prepare a meal for 6-12 people, or partner with another volunteer to do so; you may drop off your contributions, or stay to serve the meal. MEAL HOST: Come provide hospitality during one of evening meals, eating with and visiting with our guests. OVERNIGHT HOSTS: Come spend the night in the Family Life Center (in your own separate "bedroom"), being available if our guest have a need (rare). VAN DRIVERS: Usually our guests have their own transportation, but sometimes we may need to transport some to/from school or work.